● Aric Almirola started second and finished third, collecting eight bonus points. ● No. 10 Shazam/Smithfield Ford Mustang ran in fourth for the majority of the opening stage. ● Almirola pitted during a caution on lap 68 for four fresh tires, fuel and air pressure and chassis adjustments. ●He said the No. 10 Ford was loose at the beginning of the stage, but the car drove better as the laps wore on. ● After he pitted he noted that the tires were spinning on the exit of the turns, but the car was turning better. ● Almirola passed the No. 11 car on lap 112 to finish third in Stage 1. ● He pitted for four more tires, fuel and air pressure and chassis adjustments at the conclusion of the stage. ● Started fourth and finished sixth, collecting five bonus points. ● Almirola piloted the Shazam/Smithfield Ford Mustang inside the top-five until lap 251. ● At the end of the stage, he radioed crew chief Johnny Klausmeier that he needed more drive off of the turns and better turn in the middle. ● Almirola pitted for four tires, fuel and air pressure adjustments at the end of Stage 2. ● Started fifth and finished ninth. ● On the opening laps, Almirola and the No. 18 car made contact, forcing the No. 10 Shazam/Smithfield Ford outside of the top-10. ● Almirola pitted on lap 312 under caution for four tires, fuel and air pressure adjustments to counter tight-handling conditions. He landed seventh off pit road. ● During the next caution period on lap 371, Almirola pitted for four tires, fuel and adjustments, but an issue with the right-rear tire during the pit stop demoted the No. 10 Ford to 13th place. ● Almirola raced back to eighth place and battled for seventh until the lap-445 caution was called. ● He pitted for four tires and fuel and said the balance of his Ford Mustang was improving, but an issue on pit road resulted in Almirola restarting in 12th place. ● He piloted the No. 10 Shazam/Smithfield Ford back to ninth place before the checkered flag waved. ● Almirola earned his fifth top-10 of the season and his fourth top-10 in 21 career Monster Energy NASCAR Cup Series starts at Martinsville. ● Almirola has finished among the top-10 in every race this year with the exception of the season-opening Daytona 500. ● Almirola finished third in Stage 1 to earn eight bonus points, and sixth in Stage 2 to earn an additional five bonus points. 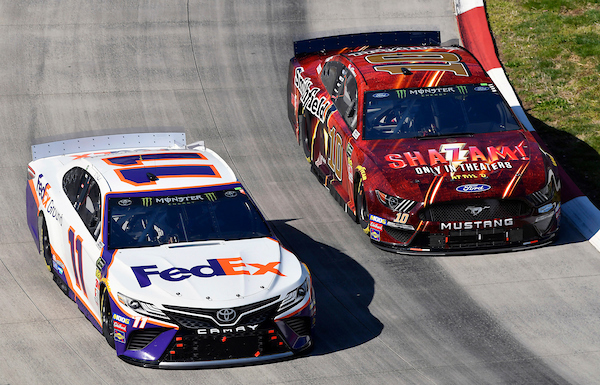 ● Kyle Busch leaves Martinsville as the championship leader with a 21-point advantage over second-place Denny Hamlin.